In regard to form the vessels may be divided into two groups; viz., (1) cups and (2) bowls. A cup was usually called "kos," a designation applied both to the cup of the poor man (II Sam. xii. 3) and to that of the king (Gen. xl. 11, 13, 21). I Kings vii. 26 shows that the rim was often bent, and Isa. li. 17, 22 indicates that the sides were bulging. In Gen. xliv. 2, 12, 16 et seq. the term "gabi'a" is used to designate "Joseph's cup," which, according to Jer. xxxv. 5, seems to have been larger than a kos, and was probably a chalice or a goblet. The same applies perhaps to "ḳubba'at" (Isa. li. 17), to which the accompanying word "kos" is probably a gloss. "Kefor" (I Chron. xxviii. 17; Ezra i. 10, viii. 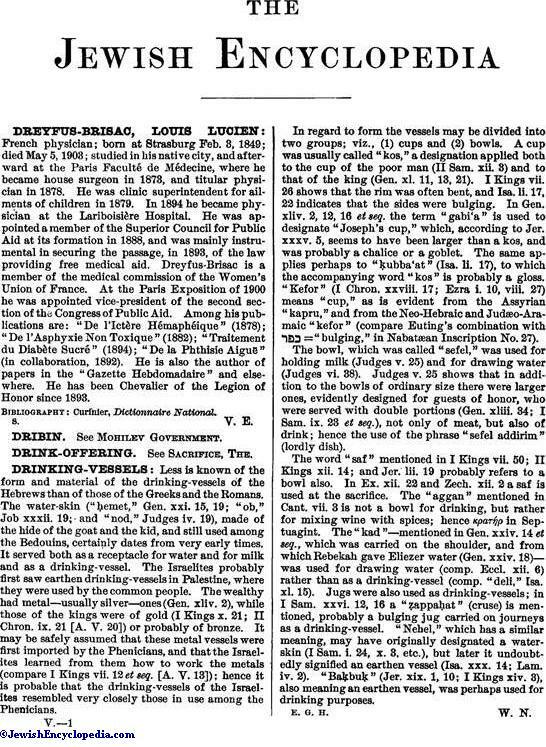 27) means "cup," as is evident from the Assyrian "kapru," and from the Neo-Hebraic and Judæo-Aramaic "kefor" (compare Euting's combination with = "bulging," in Nabatæan Inscription No. 27).